Earlier this year, we asked our members what social platform they preferred using. Facebook won, hands down. So, we made it a priority to get a Facebook page up and running where we could share good news about farmers, farm workers, and agriculture. Every day, people are liking, sharing, and commenting on our stories. Since we launched in July, we already have over 2,100 page likes. We are seeing our community grow and are thrilled by its level of engagement. Typically, a decent level of interaction on an organization’s Facebook page is around 3-5% (post clicks + reactions + shares + comments, versus number of people reached). CHC often achieves over four times that amount! 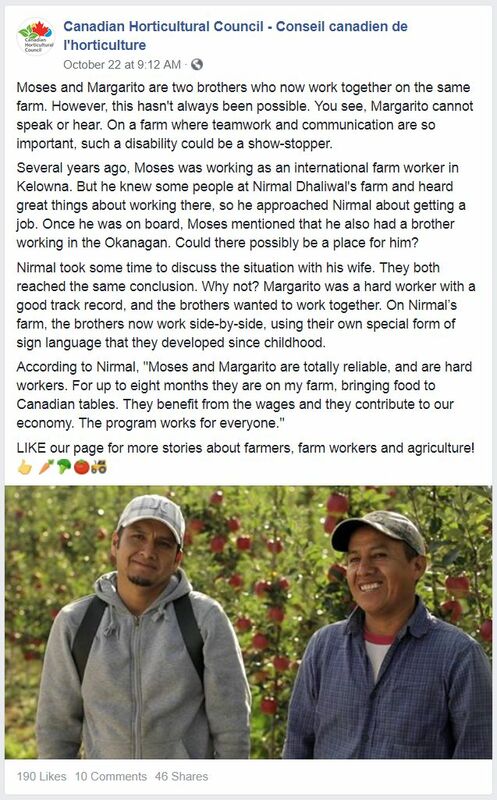 For example, our recent post about a couple of brothers working together in the Okanagan currently has an engagement rate of 16% (see bottom of article for post). 16% of people reached interact with our content. If you haven’t checked out our Facebook page yet, now’s the perfect time to do so. There are conversations taking place right now that you might be interested in. And don’t forget to “like” our page for updates. The more people who get involved and share our content, the greater an impact we will have. Our Facebook presence is an important platform on which to roll out our labour awareness campaign. This campaign, launching shortly, is made up of about 20 short videos and a long-format documentary that illustrate the mutually beneficial relationship that international farm workers have with their employers. A thriving Facebook community will help us carry the message to people across the country. Please help us amplify our message by liking our page and sharing our content, and stay tuned for the campaign that will launch shortly! The following post is typical of the stories that have become very popular with Facebook users.